First up Pisanos and Beeson. If you are ever in Dayton, the museum has an exhibit with the COMPLETE bar from the 4th FG and some of the original art of his on it as well. Anyone know how Don is doing? 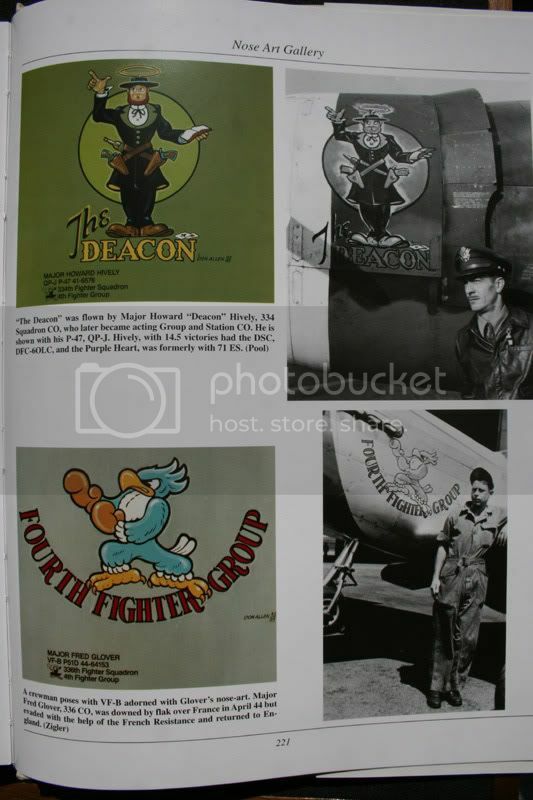 A good reference site below for those that don't have Speer's "The Debden Warbirds"
Don Allen reproduced most, if not all, of his 4th FG nosearts for The Air Mobility Command Museum at Dover Air Force Base in Dover, Delaware. 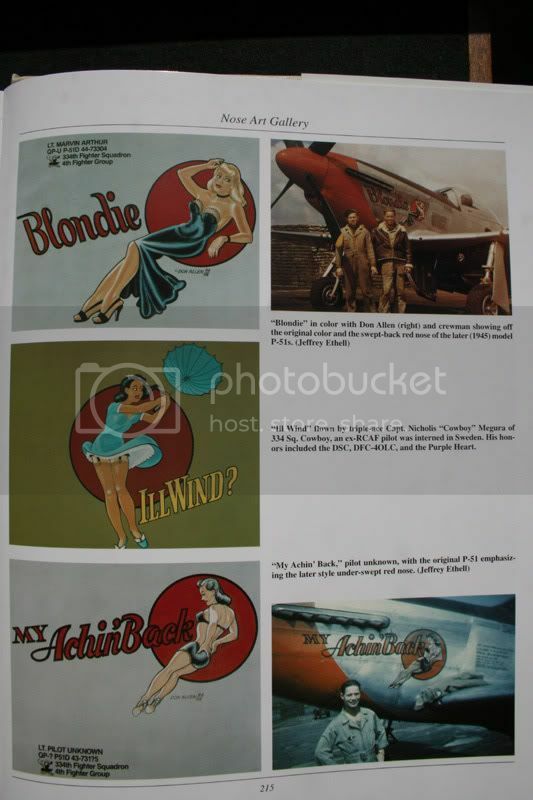 If one compares his reproductions to photos of his originals, as below, you can make out some differences in outline. 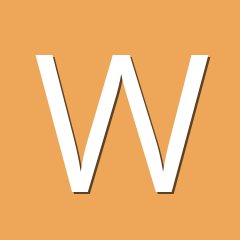 But who is going to argue the colors used by the originating artist himself! 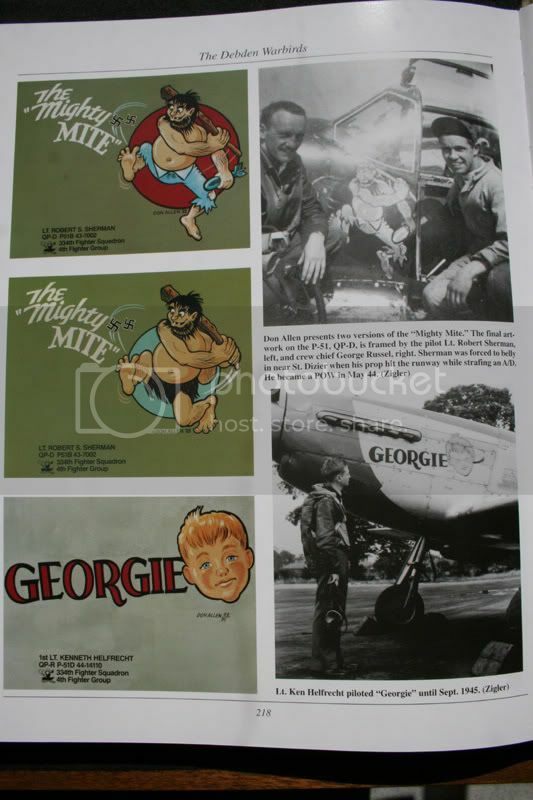 I can't think of any other nose art artist who has reproduced his depictions so extensively for the enjoyment of future generations. 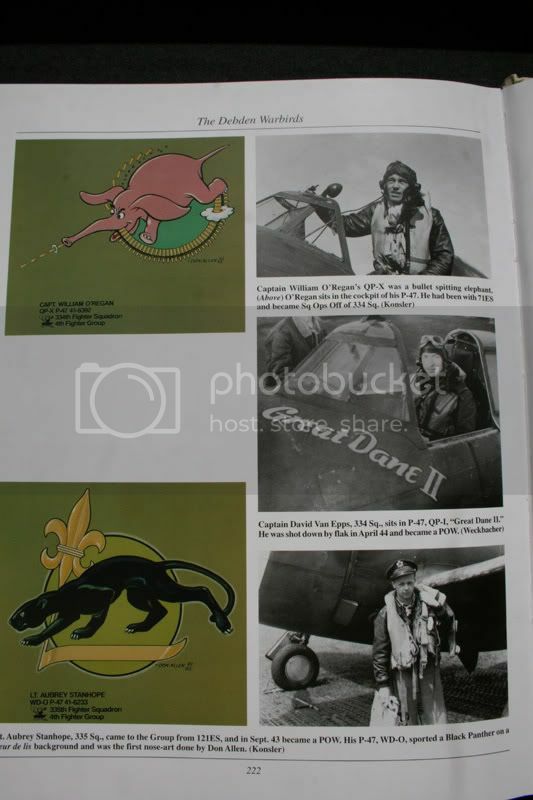 Sorry if I jumped the gun on this one Stormy, but it might be fun for some folks to compare close up shots of Don's reproductions with the photos of his originals that you show out of Speer's book. 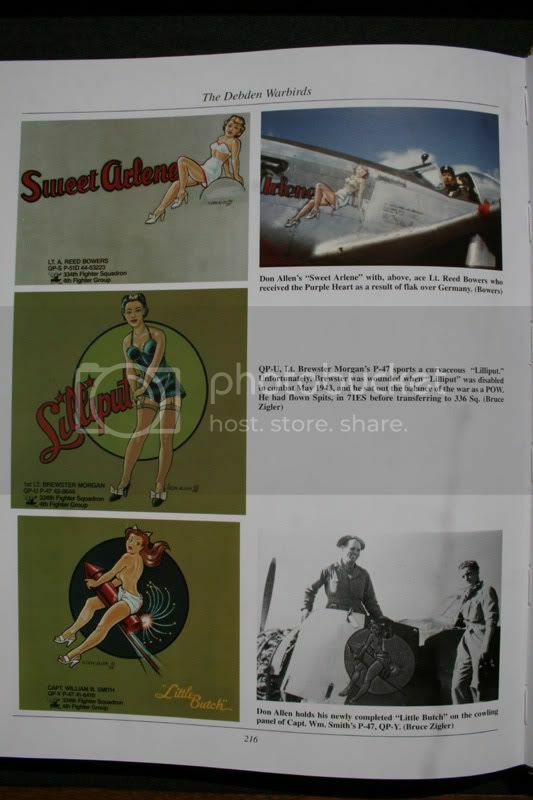 The WWII era nose art of Don Allen was painstaking recreated a few years ago by artist himself for the AMC Museum at Dover, Delaware. 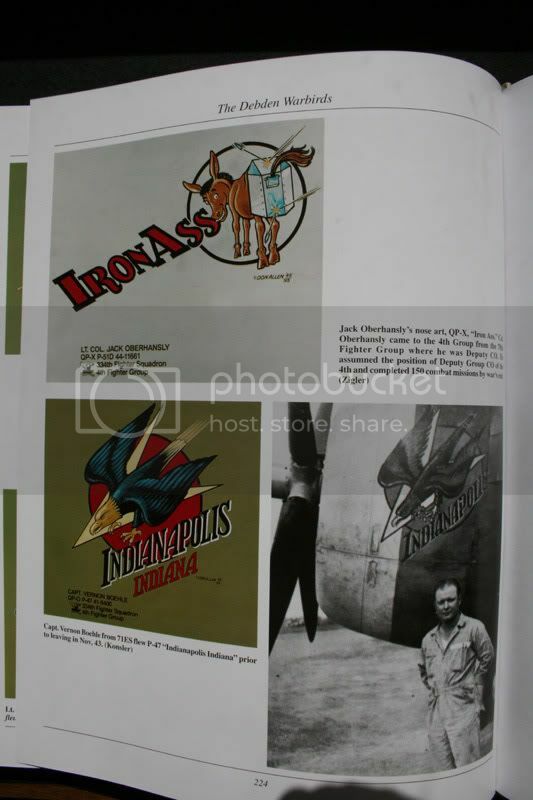 The artist, now an elderly gentleman living in northern Ohio, served virtually the entire war with the 4th Fighter Group's famed 334th Squadron. The images in this collection were taken from Don Allen's careful reproductions, all of which today hang in the gallery at the museum. The original artworks, as well as the planes themselves were all smelted down and sold for scrap soon after the war's end. Castle, Hollander and Speer (the author of 'Debden Warbirds'). 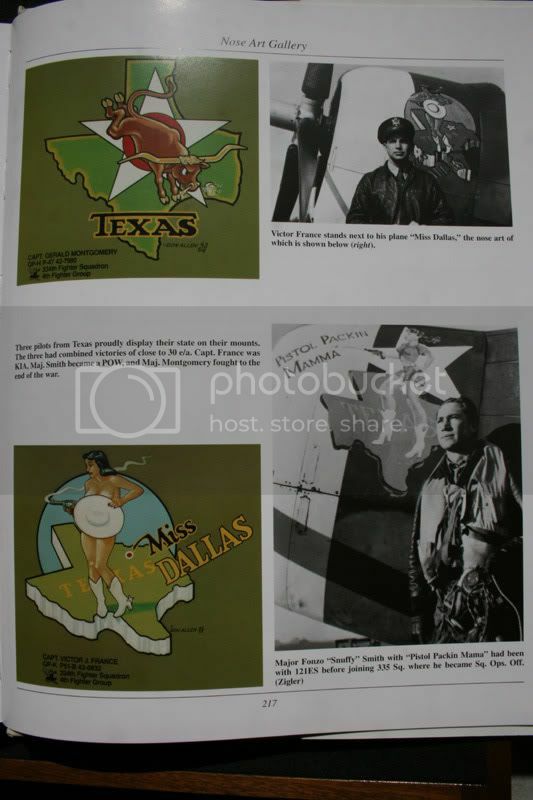 My two favorite Don Allen nose art depictions are "Miss Dallas" and "The Deacon". "Miss Dallas"-A well endowed woman trying in vain to cover up her physical attributes with a ten-gallon hat. She may have forgotten her clothes, but notice that she did not venture out without her boots and smoking gun! Ah, good to be home with ALL FOUR kids on this "holiday" (for whom? :lol: ). Notice the evidence of a "panel swap" on Deac's kite (different camo line). 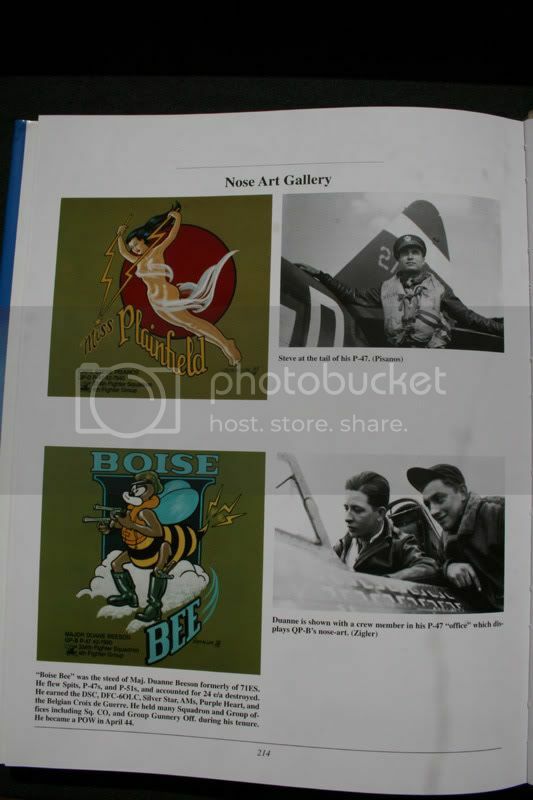 During the 4th's P-47 era, art panel-swapping happened on a fairly regular basis. 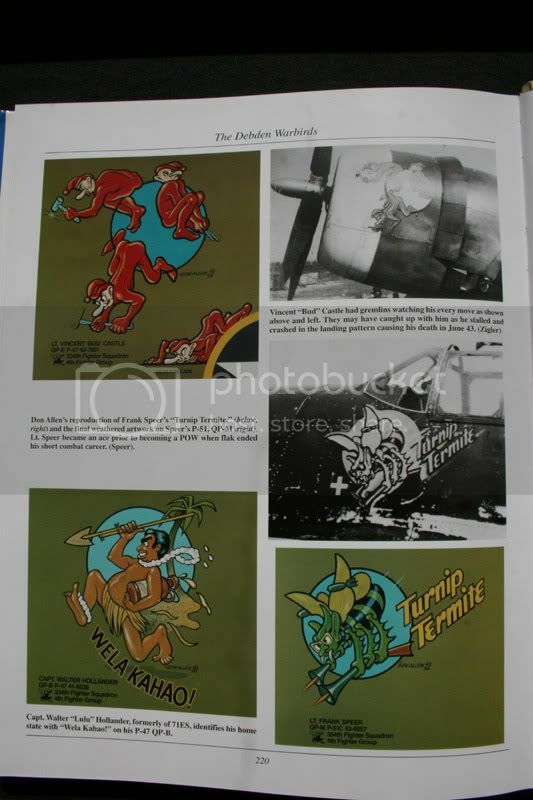 Gentile's Donnie Boy P-47 art panel was originally on 42-7884, a P-47D-1. When Gentile got one of the very first D-5s in the 4th (42-8659), the panel was "swapped" to 8659. All, repeat ALL of the decal sheets show 8659 as the "only" Donnie-Boy. 7884, by the way, was passed on to crew chief Larry Krantz, and the plane was recoded VF-P, Krantz's personal code from '42-'45, and became Lucky - Reggie's Reply, the P-47 usually associated with Johnny Godfrey. 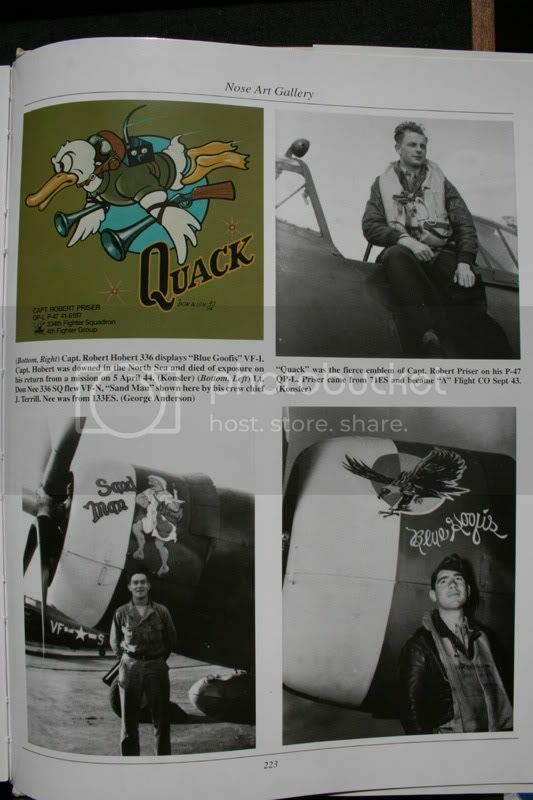 I'm thinking that the "crewman" in the lower picture is Glesner "Weck" Weckbacher, a long-time 336 crew chief and very prolific photographer during the war. He was in a perfect position to "see it all" from '42-'45, and luckily for us, he used his camera quite often. 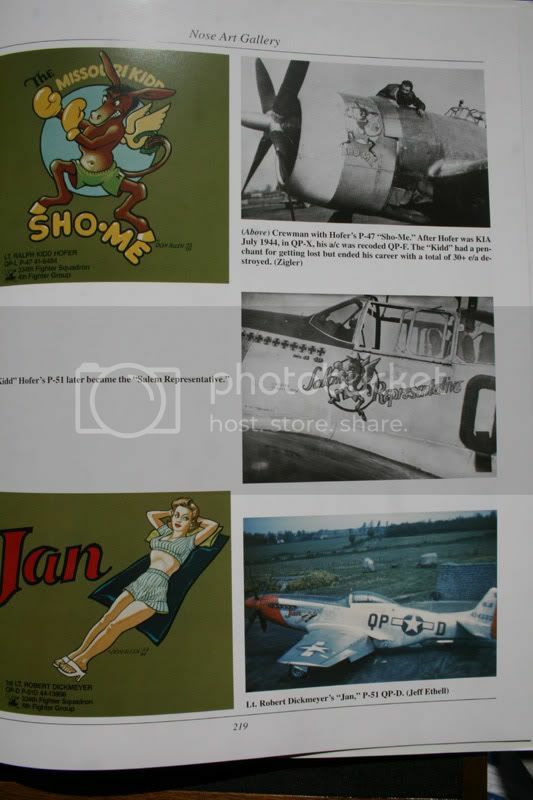 Without him, we'd have never known just how much P-47 art there really was in 336 Sqdn. Looks just like him from pix I've seen.